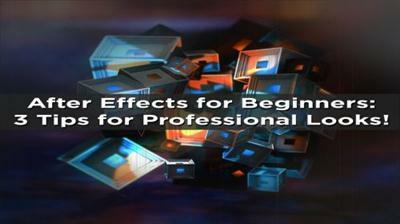 After Effects for Beginners 3 Tips for Creating Professional Looks | Free eBooks Download - EBOOKEE! Posted on 2016-09-18, by 6_1_9. In this beginner course we'll cover 3 basic tips you'll use over and over again as you progress in the software to create polished and professional looking pieces. This effects are super easy to achieve and really add a ton of value to any piece, be it digital art, photography, or video. We'll discuss how to set up a composition from your media, apply effects using adjustment layers, color correct using the curves effect, create artificial glows using shape layers, and two different solutions for creating a vignette. As a bonus, I'll even show you how to adjust your composition's overall saturation and hue, and how to add interest using additional elements from the web. 2016-07-13SkillShare - After Effects for Beginners - Get Started with Motion Graphics! 2016-06-08SkillShare - After Effects for Beginners - Get Started with Motion Graphics! No comments for "After Effects for Beginners 3 Tips for Creating Professional Looks".